The end of Final Fantasy VII is kind of weird. Sephiroth’s defeated, and everyone’s escaping on the Highwind (which it turns out can transform into a super awesome highly aerobatic jet plane) and the Northern Crater is kind of imploding and stuff is happening all over the place like mad in full FMV goodness. It looks pretty quaint by today’s standards, but a ten-plus minute pre-rendered CG video was a really big deal back in 1997. Even though the character models are laughably simple in comparison to the real-time models used just a generation later on the PS2 for Final Fantasy X, they actually still look quite beautiful in a way. Taken as a product of its time, I’m still impressed with the visuals of this game over fifteen years later. 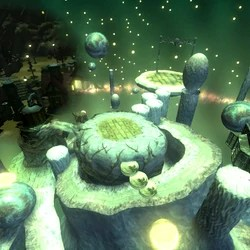 Of course visuals aren’t everything, and I’m a little disappointed that Square’s (now Square Enix) legacy since FFVII has been emphasizing flashy visuals to the point of being ridiculous (you can always count on a late generation Final Fantasy to be visually stunning, but the aesthetic sometimes strikes me as just awful). Nonetheless, this is our ending. With Sephiroth finally dead (I don’t care what the later entries in the canon may say about him coming back, Sephiroth is D-E-D dead now) there’s nothing blocking Holy from attacking Meteor, so it emerges from the planet around Midgar just as Meteor’s about to strike (I thought we had a week to go, but whatever). Unfortunately, it’s too late and Holy doesn’t have enough power to stop Meteor, so the Lifestream lends a hand. Midgar’s utterly demolished in the process, and everyone across the globe watches in terror as these two colossal forces battle it out in the sky (I’m not entirely sure how folks in Cosmo Canyon can see anything since that’s theoretically on the other side of the globe, but maybe that’s why we don’t get to see anyone from that locale during the final cutscene). The final image we see is Aerith, watching from the Lifestream. I just have to say, after seeing this ending again, I love it. It feels like a great summation of the game’s central theme dealing with humanity’s need to balance natural resources with technological development. 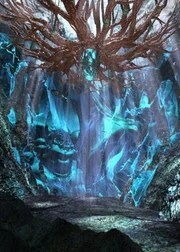 While the majority of the story has revolved around chasing Sephiroth around because he’s trying to destroy the world and become a god, we have as our background a world that’s slowly being ravaged of its natural resources (in this universe, the very lifeblood of the planet) due to simple human greed. It’s important to remember that Shinra is not an intrinsically evil entity; a case can be made that Shinra is actually very beneficial as its the major developer of new technologies that go a long way towards improving the quality of life for most of the inhabitants of the planet. What makes the corporation an antagonist to the party is the fact that it’s run by jerks who are consumed with greed to the point of ignoring basic human decency (Cloud, Tifa, Barret, Aerith, Red XIII, Vincent, and Cid are all direct victims of people at the top of Shinra abusing their power in order to make more money or accomplish some other selfish goal). What I’m trying to get at is that Shinra’s evil is incidental, which doesn’t necessarily diminish the way they ruin a lot of lives, but does suggest that we take into consideration the good they do as well. They are ultimately just human, even if they are painted in rather broad, unsympathetic strokes because of the personal circumstances of our heroes. Anyway, it should be noted here that for many years after Final Fantasy VII was released, there was a lot of debate in fan circles about the interpretation of the ending. As a kid, I was really invested in reading the ending as humanity surviving, mostly because I hated the idea of having a save the world story where humanity didn’t survive (there’s an interesting deconstruction of “save the world” going on here where the player’s asked to consider just what they expect from that kind of story); it seemed pointless to me at the time. Now that I’m older and have a slightly better appreciation of existentialism (the belief that it is only our actions that have the potential to create nobility in an otherwise meaningless existence) and Christianity (the belief that it is an essential part of love to oppose evil where it is found regardless of the personal cost in order to redeem the good), I’m actually really cool with this ending. I think it’s pretty bold for a video game to suggest that the state of humanity is such that we’re just not that good for life on our planet, and the best option might be our disappearance. I’m not suggesting that that’s what anyone who’s reasonable would actually want. The amount of interim suffering while humanity dies out would be incredibly tragic. A better choice would be, and I think this is the one that the game strongly advocates, is for humanity to recognize the effects it has on its home, and move towards a path of development that harmonizes with our environment. Of course, all the wonderful ambiguity and sombre tone of this ending got ruined by Final Fantasy VII: Advent Children, which shows us a post-Meteor world where humanity has survived and Cloud is an emotional wreck because of his survivor’s guilt in relation to Zack and Aerith’s deaths (which, keep in mind, he wasn’t even indirectly responsible for). I’ve seen Advent Children only a couple times, and while it’s a visual feast, it just feels like a cash in. The fan community was clamoring for more from this world, and what we got feels disappointing to me. I like Cloud as a protagonist because in Final Fantasy VII we went through the journey of him being forced to deconstruct and rebuild his identity, which betrayed the myriad psychological problems he brought with him getting off that train in the game’s opening scene, and then after he came to grips with his real past, he was able to move on and regain some of that confidence that was part of his facade, except now it was genuine and tempered with humility. Cloud ends Final Fantasy VII as a character who’s gone through a complete developmental arc and emerged emotionally and psychologically healthy. Then Advent Children came along and made him angst over his friends’ deaths when we saw in the game that he came to terms with those events! To sum it up, I think that Final Fantasy VII is a fantastic standalone game. It’s very much a product of its time, and a lot of the design elements feel a little archaic now, but the core experience and story are still satisfying, even with all of their flaws. I just wish Square Enix would just leave the blasted franchise alone instead of milking it for all the crossovers and such. Sephiroth is dead and Cloud is emotionally whole at the game’s close. I’m happy with that ending. I don’t need anymore. Shinra’s a shambles, the WEAPONs have been neutralized (well, the ones that actually do stuff to threaten people; I’m content to let Ruby and Emerald just chill out in the wilderness because they don’t seem that interested in terrorizing the masses–also, I’ve never beaten them and I’m not going to start now), all the fancy chocobo materia is in my possession, Meteor’s a week away from landing, and the shield over the Northern Crater is broken. It’s time to go face off with Sephiroth. Before our heroes go to do that, Cloud tells them to take some time and go see their friends and family. Confronting Sephiroth is most likely a suicide mission, and even if they succeed the human race may still be wiped out by Holy, so it’s best to take care of these things ahead of time. Everyone disperses to get their heads straight, and Cloud and Tifa watch the Highwind since all the people they loved are dead (nice consolation prize). If Tifa was the player’s date at the Gold Saucer earlier before visiting the Temple of the Ancients, then there will be some extra dialogue in this scene suggesting that the two spend the night together. The following morning everyone shows up, even Yuffie (whom Barret was sure would skip town). Cid pulls a lever that he’s been wondering about on the Highwind‘s dashboard, and all the propellers fall away to be replaced by jet engines (because where we’re going, we don’t need roads?) and our heroes race off to the Northern Crater. The trek down to the center of the planet is largely uneventful (Final Fantasy‘s final dungeons are historically uneventful with virtually no story until the player reaches the final boss), though there are a couple of opportunities to split the party up, which operates as a way to get the loot that’s strewn about on the various branches of the path without having to backtrack (unfortunately, this isn’t explained in the game, so I totally went and did all the paths to get free stuff). There are a lot of really strong enemies in the Northern Crater (obviously), but nothing that’s really that difficult to deal with. The real fun comes when we reach the Center of the Planet (yeah, we’re apparently traveling several thousand miles down while on foot in the space of a few hours) where we encounter first Jenova (the whole thing) and then, finally, Sephiroth. Now, I may have mentioned this a while back, but until this playthrough I’d never beaten the final boss without cheating. This time, I did fine (although there was a very close call during the final fight when Sephiroth used his attack that reduces everyone’s HP to 1 and I nearly flipped out because I had forgotten he was going to do that). The fight with Sephiroth is broken up into two stages. The first is kind of a gimmick fight, because depending on the player’s performance in the final dungeon, this fight can be done with up to three separate parties attacking different parts of the boss (I can’t remember exactly what the conditions are for getting the three party formation, but I didn’t do it because I had to fight with two parties–no big loss because it meant I didn’t have to bother with equipping Cid and Cait Sith). In this stage, Sephiroth’s in some weird kind of larval stage where he’s all purple and green and appears to be melded with Jenova’s body (the boss is called Bizarro-Sephiroth, which is a mistranslation based on the romaji of his Japanese name, Ribasu-Sefirosu–Rebirth-Sephiroth–the localization team thought it was supposed to be Reverse-Sephiroth, and went with Bizarro as a synonym; I’d just like to take a moment to acknowledge that FFVII has an accidental Superman reference, and it is way more awesome than anything about stubborn gorillas). It’s not a difficult fight. The second part of the fight is with Sephiroth in what I think of as his Christ-pretender/Divine ascendant form. If you’ve played Final Fantasy VI, then you’ll be familiar with the final boss of that game, Kefka, who has a similar pseudo-divine motif (presumptive gods are a common feature of the series overall). Anyway, it’s this form of Sephiroth that was the start of the one black wing design feature that I think is so loathsome (in this version the wing’s actually replaced his right arm; though I’ve not noted it before, Sephiroth’s a southpaw). The name of this version is called Safer-Sephiroth, which has a more complicated background than other weird translations in this game. Safer may be a corruption of Savior (sticking with the false Messiah theme) or a mistranslation of Seraph (Sephiroth’s final form has six wings where his legs would be, echoing the description of Seraphim found in the Book of Ezekiel) or even a transliteration of the Hebrew word for book (because Sephiroth’s name is derived from the Sephirot, the 10 aspects of creation in Kabbalah, this suggests that the final boss’s name is intended to be understood as Hebrew for “Book of Numerations”). No matter what you think the name is supposed to be, it’s clearly one that was chosen in order to have a ton of layers and echoes of the presumptive god motif. He’s a moderately difficult boss (see above re: my freakout over the instant critical HP attack), but I beat him. Oh right, there’s one more stage of the fight. Beating Safer-Sephiroth wins you the game, but following that knockdown drag out, we have one more fight that’s more or less a glorified cut scene (this last duel between Cloud and Sephiroth even uses special, higher poly-count character models to emphasize the cinematic quality of it). Cloud gets sucked back into the Lifestream one more time to confront Sephiroth, who’s ready to end this thing. Except that Cloud’s limit gauge is full (it’s always full for this battle) and he knows his ultimate limit break Omnislash, regardless of whether you actually bothered to learn and set it. Cloud lets loose with a flurry of impossible blows (or he just attacks regularly as an instant counter if you let Sephiroth go first) and somehow only manages to give Sephiroth a bloody face (limitations of the technology, I suppose), signalling his victory. After this, Cloud gets ejected from the Lifestream, and it’s time for everyone to run for their lives. Reaching the Northern Crater’s not a very difficult prospect (though it is time consuming). The party has to do a lot of climbing and trudging through arctic conditions (with no indication that they’re wearing extra warm clothes), but once they overcome those obstacles it’s mostly just a long walk. 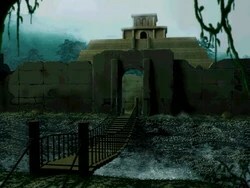 Deep inside the crater, Cloud and company begin to encounter Sephiroth at frequent intervals. He appears to be using the black cloaked figures that we’ve been encountering to create images of himself. Remember last time when we found out that the Jenova cells in these poor souls drives them to try to reunite with Jenova? Well, it turns out that Sephiroth has actually been using his force of will to exert control over Jenova, so all the cloaked figures are under Sephiroth’s command (his influence gets stronger as they get closer to him). Also, because Jenova is a shapeshifter, Sephiroth has been forcing his minions (and the body of Jenova) to take his form. Yep, up until this point, we have never actually encountered Sephiroth in person. Any time the party has seen him, it’s been Jenova’s body (the one we saw back in Shinra HQ) transformed into his image (this explains where all the bits of Jenova that turn into monsters have been coming from). 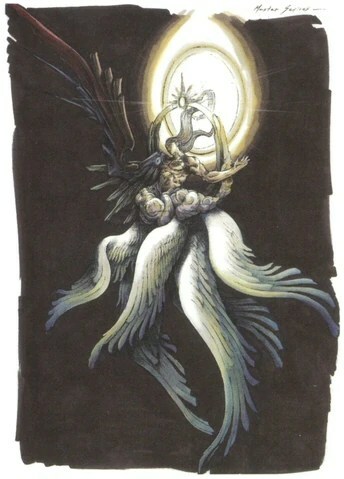 The purpose of all Sephiroth’s sudden appearances here in the crater is to screw around with Cloud’s head (some more) by showing him images from the Nibelheim incident, but with a black-haired man in Cloud’s place. Cloud starts out convinced that it’s just a ploy to try to confuse him and everything is just lies, except that at this point Tifa’s come along for moral support (I had forgotten she forces her way into the party at this point, because I decided to make her a regular party member on this playthrough), and she seems very uncomfortable with Cloud’s confidence that these are all just made up images. Sephiroth taunts Cloud by saying that all his memories are just constructed, and he was created as a failed clone of Sephiroth five years ago after the Nibelheim incident. All his childhood memories are based on Tifa’s memories of the real Cloud while everything about his time in SOLDIER was based on the memories of the guy who really came to Nibelheim five years ago with Sephiroth. Tifa doesn’t do much to contradict Sephiroth’s claims (thanks, Tifa), so Cloud pretty much has a total mental meltdown. The party get transported to the central chamber of the crater, where Rufus and the rest of the Shinra bigwigs have just arrived. Probably my favorite background detail of the entire game happens in this scene, where one of the WEAPONs (remember, if it’s in all caps it’s important!) opens its eye and stares at everyone (to give a sense of scale, the WEAPON’s eye is about three times bigger than any of the character models on screen). Cloud’s breakdown continues as he begs Hojo, who’s come along with the rest of Shinra, to give him a number so he can have some semblance of an identity besides just being a failed lab experiment. Hojo, who is ecstatic that his Jenova Reunion theory has been proven true, scoffs at Cloud, expressing regret that it was only a failure that made it all the way to Sephiroth. Speaking of Sephiroth, we finally get to meet him in person here. It’s kind of underwhelming, because the real Sephiroth is only a shade of his former self–he’s encased in a giant piece of materia and his entire lower body is missing. Despite that, he still manages to make Cloud go utterly bonkers (our hero starts walking on the ceiling, because magic) and hand over the Black Materia. All I can say here is, why did the party think it would be a good idea to bring the Black Materia with them to the Northern Crater at all? They have enough sense not to let Cloud hold it, but that doesn’t matter because Barret (who was given the task of keeping it safe) gets tricked by Sephiroth into giving it back to Cloud anyway. This whole scenario’s a headscratcher, because I’m pretty sure if they’d just left the Black Materia with someone they could trust (like Bugenhagen, maybe?) instead of bringing it with them, then the entire second half of the game might have been prevented (the more I write about this game, the more I realize that a lot of the plot elements require the characters to do some really stupid things that are easily avoided). So, with Sephiroth firmly in possession of the Black Materia now, things get really bad. The WEAPONs break free and fly off to terrorize humanity (for the good of the planet, of course) and everyone has to evacuate the crater. Cloud disappears in the shuffle, and everyone else gets whisked away on the Highwind, the flagship of Shinra’s air force. So now that Aerith’s dead, it’s time for everyone to pick up the pieces and head north to catch up with Sephiroth again (most of this game’s plot revolves around chasing after Sephiroth, and after a while, it does tend to get a little old; at least, it would if the writers didn’t keep spooling out new reasons we should care about chasing Sephiroth down). Fortunately, we now have some interesting questions to try to answer. Perhaps most pressing is the statement that Jenova (her only attributed line in the game) makes just after the party defeats another part of her body, Jenova-LIFE. As she dissolves into whatever alien parasites dissolve into when they die, Jenova tells Cloud that he’s a puppet. There are some interesting implications here, because whenever you call someone a puppet, it’s not a good thing. Puppets are just facsimiles of living creatures who give the impression of being alive while their controllers manipulate them. Cloud’s definitely done some weird stuff lately that might suggest he’s being controlled, what with the homicidal urges towards Aerith and handing over the Black Materia, which is definitely disconcerting, but it’s not as damaging as the suggestion that Cloud’s identity is just a facade. Oh, right. No one there remembers him. Oh, yeah. There was something about that story that she wasn’t quite comfortable with. Okay, well maybe Cloud is just a puppet. Now, I’m sure everyone can figure out that Cloud’s backstory doesn’t add up with the details that we’ve come across so far, but he is a real person, and it’s reasonable to assume that some parts of his story are legitimate, since Tifa really is a childhood friend. Nonetheless, this one line from Jenova sets up the major psychological tension of the second half of the game. Before, we were chasing down Sephiroth because he was killing people all over the place and the natural thing for a group of heroes is to try to stop a villain from being villainous. Also, there was the whole thing with undermining Shinra, though I feel like the ecoterrorist plotline gets shoved aside pretty consistently once Sephiroth’s on the scene (this is to be expected, because while Shinra’s evil, it’s not seeking godhood). Anyway, the motivation for the chase strikes me as pretty thin, and seems like a rather standard reason for adventure. Pulling the narrative reverse here where we find out that the hero we’ve been playing as might not be who he says he is (a very novel concept, considering that the typical JRPG formula up to this point was to have a hero who acted as the player’s avatar within the game world; as the person playing the game, there wasn’t supposed to be any mystery surrounding your own player character) is pretty compelling stuff. I’ll be honest that I find Sephiroth to be a rather lackluster villain in a lot of respects (much of it may have to do with Square’s overuse of him in their crossover properties), but the idea that he’s going to screw around with the hero’s head and make him doubt his own identity is really fun stuff to watch. From here on out, as I’ve said before, Cloud’s just going to get more and more depressed and disconnected from who he thought he was. Anyway, that’s enough babbling about characters, we have a snowboard to get! So Aerith’s just run off to try to stop Sephiroth from summoning Meteor, and we now know that Cloud’s a somewhat unreliable hero (I kind of wish the developers had done more with this concept in gameplay terms, like making Cloud just sporadically do something deliberately harmful to the party in the middle of battle even if it would have had the potential to be really frustrating if Cloud happens to do something really crazy powerful with the wrong target). It’s time to follow Aerith to the Northern Continent (how did she get there if we still have the Tiny Bronco?) where she’s gone off to the Ancient City (ruins of the capital city of the Ancients) to stop Sephiroth from summoning Meteor somehow. Getting there’s not terribly interesting, so we’ll rejoin the party when they catch up with Aerith. Cloud and company finally catch up to Aerith in the basement of the Ancient City’s central building, where she appears to be praying. As Cloud approaches, he has another of his psychotic episodes and draws his sword in an attempt to slice Aerith in half. The player can have some fun here trying to make Cloud resist what’s happening, but there’s no way to proceed without letting him make the attempt. 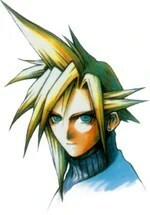 Of course, then Cloud comes back to his senses just before he goes through with it, and Aerith’s safe. Everyone breathes a sigh of relief. Then Sephiroth drops from the ceiling and runs her through with his sword. I’m kidding, of course (about being happy that Aerith’s dead, not about Sephiroth killing her; everyone on the internet already knew that was going to happen). Now, this event has a long history in the gaming community, because when the first players encountered this development, they were rather shocked. There’s very little buildup within the game’s narrative to suggest that Aerith is in any sort of danger of dying, or that her death will be necessary to prevent Sephiroth from achieving his goals. The point of the scene, according to Final Fantasy VII‘s writers, is to reflect how death affects us in the real world, with it happening unexpectedly and without purpose. A lot of work went into making sure this event had a realistic impact on the rest of the main characters, and I think that generally it’s successful. Small touches like Cloud’s speech box overlapping and interrupting Sephiroth’s during his evil post-murder monologue to say that he doesn’t care about the bigger scheme going on help enhance the feeling of the moment; Aerith’s dead now, and that’s a fact that Cloud and everyone else has to deal with. Right in the midst of everything going on, he doesn’t care what Sephiroth’s motivations are. And for all my hating on Aerith (oh man, do I dislike her), I still get what the writers were going for here, and I feel it. I’ve watched this scene several times, and I can honestly say that even though leading up to and following it I’m not that bummed about losing a party member that I don’t like using anyway, in the moment I empathize with these characters. They all have a unique way of saying goodbye, which are beautiful bits of character animation, even though they use the low-res map models. Yuffie nearly collapses into Cloud’s arms crying after she says her goodbye, and I remember that even though she’s a deadly ninja, she’s also just a kid who’s probably never experienced a loss like this one before. Pulling back and looking forward to the remainder of the game (I may not be remembering exactly right, but I estimate that this is about the halfway point), this event sets up a new, much more personal motivation for Cloud and folks to mosey on toward their next confrontation with Sephiroth. Before it was about high-minded ideals and saving the planet; now it’s about paying Sephiroth back for the murder of their friend. Also, from a character standpoint, Aerith’s death marks the beginning of Cloud’s descent into the melancholy that so dominates his characterization in other entries in the Final Fantasy VII canon. Before now, he’s been a more or less laid-back, confident guy who doesn’t have any trouble kidding around with his friends. Now that he’s both attempted to kill Aerith himself twice and failed to prevent her actual murder, he has a lot of pent up feelings of guilt to work through, on top of all the other stuff that we (and he) will be learning about his past soon. I really like happy Cloud (mostly because I think his angst is overplayed later in the series to the point that it becomes his defining character trait), but here I’m looking forward to seeing him develop and grow into a more nuanced and realistic understanding of himself. Anyway, once the body’s safely interred at the bottom of a lake, it’s time for everyone to move on further north. Sephiroth awaits past the Great Glacier in the Northern Crater–the location of the last great wound the planet received. So Cloud and company arrive at the Temple of the Ancients, and it becomes clear why Aerith has forced us to bring her along. This place is crawling with the spirits of Cetra who’ve resisted returning to the Lifestream in order to provide guidance to future generations of Cetra who come to this place. Since Aerith’s the only surviving Cetra, that means she’s necessary in order to decipher what the little old man spirits in the funny hats are trying to say. Of course, what they’re saying is essentially, “Don’t come here!” and “Watch out for Sephiroth!” so maybe Aerith wasn’t really that necessary after all. Still, she’s with us, so we’ll make the best of it. Deep inside the temple, the party reaches a room with a series of paintings that resemble Egyptian hieroglyphs depicting the Cetra worshiping what I’m guessing is the planet at their temple, then a bright star appearing in the sky which comes closer and turns out to be a meteor (or rather Meteor, because there’s only one in all of space, apparently). The last panel shows the Cetra burning alive after the impact of Meteor. So clearly, this Meteor thing is bad. Also, apparently, it’s part of Sephiroth’s master plan to submerge himself in the Lifestream and become a god, because if the planet gets hit by a cataclysmic rock from space (with magical planet-seeking properties) then it’ll divert a bunch of Lifestream energy to the impact site in order to heal it. Because, y’know, a planet fixes itself in the same way humans heal cuts and bruises. From a scientific perspective, this is all really silly stuff, because a lot of what’s explained here is simply posited to be run on magic. 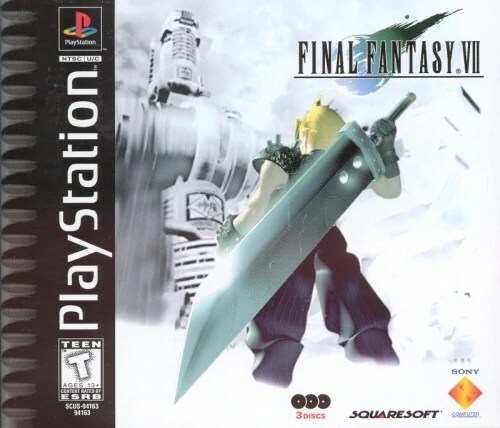 That’s not necessarily a problem, but Final Fantasy VII was notable at the time for having a more sci-fi flavor than previous incarnations, and all these revelations basically took the game’s phlebotinum of Lifestream energy and said it could do pretty much whatever the writers wanted it to do. We just departed from a very loose science fiction setting a la Star Wars and went full on urban fantasy with these plot developments (keep in mind, of course, that this game has “Fantasy” in the title). Of course, knowing Sephiroth’s plan doesn’t really help the party out a whole lot, since we discover at pretty much the same time that the key to summoning Meteor is something called the Black Materia (color coded for your convenience), which it turns out is actually the physical building that the party’s been traversing. Cait Sith makes his noble sacrifice by activating the trigger that will cause the temple to shrink and turn into the Black Materia so that Cloud can get it for safekeeping, but then he promptly flips out and we also discover that Cloud’s a complete and utter lune. Just before the party leaves the temple so they can claim the Black Materia, Cloud has something akin to a seizure, which freaks everyone out, including me because I’m supposed to be in control of this guy. During what strikes me as a schizophrenic episode, he babbles to someone that no one else can see about getting the Black Materia and summoning Meteor while also reassuring himself that he is, in fact, Cloud. After the madness stops, Cloud calmly turns to Aerith and asks what’s wrong, to which she responds that everything’s fine in the way that people who are accustomed to dealing with crazy usually do. I’m sure it’s at this point that Aerith, if she were sensible, would be rethinking that crush she has on Cloud. Anyway, once everyone gets outside and Cait Sith sacrifices his little broken body to shrink the temple, Cloud gets the Black Materia and then turns it over to Sephiroth. 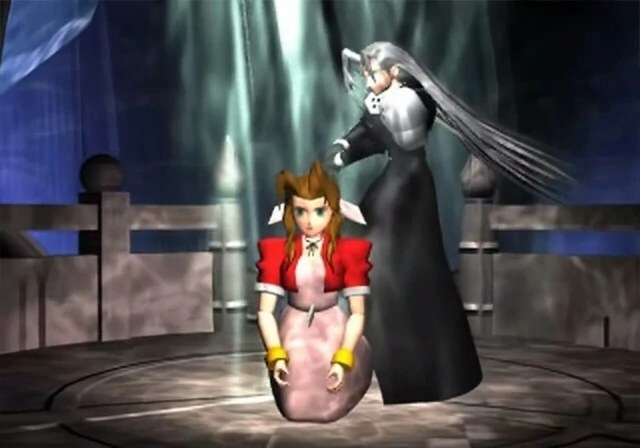 This is another freaky scene because as Cloud hands the materia over, the player gets the opportunity to control a ghostly child version of Cloud who can only beg and plead with his adult self not to do what he’s doing. It’s a pretty effective device to communicate that something very disturbing is going on with our protagonist, and even he isn’t sure what’s happening. Following Cloud’s utter botching of safeguarding the Black Materia, he then goes crazy and attacks Aerith when she tries to snap him out of it. Fortunately, the replacement Cait Sith shows up in time to help pull Cloud off of her, and then we black out. Cloud dreams about Aerith going off to stop Sephiroth in a way that only she can because she’s a Cetra, which explains absolutely nothing about what she plans to do. After this really trippy fever dream, Cloud wakes in Gongaga, a small rural village that we passed through a ways back; it’s only notable for its exploded Mako Reactor and an elderly couple who ask Cloud if he ever met their son Zack in SOLDIER. Barret and Tifa are waiting by Cloud’s bedside to reassure him that his friends still love him despite his apparent insanity, and also to tell him that he needs to get with the program because they have to follow Aerith, who really has gone off on her own in order to stop Sephiroth from summoning Meteor, and Barret’s gonna bash Cloud’s skull in if he loses his mind again (for Cloud’s own good, naturally). From a plot standpoint, this is where the stakes get raised considerably. Where before we were chasing Sephiroth down just because we figured he must be up to something sinister, we now know exactly what his plan is, and we’ve just helped him complete the first step by getting him the Black Materia. Also, it’s been revealed that our hero is mentally unstable (something that’s been vaguely hinted at before this point) and he really can’t be trusted when he’s in Sephiroth’s presence, although we still don’t know exactly why that is. This is where things are going to get way more compelling (in my opinion), because the story’s opening itself up to some very interesting psychodrama revolving around Cloud and Sephiroth; we knew before that Cloud had a beef with this madman, but now there appears to be something deeper going on beyond the simple need for revenge. Cloud’s starting to be revealed as severely damaged by his experiences with Sephiroth, and from here on out there’s going to be a lot more story exploring exactly what happened in his past that’s left him in this fragile state that we’re just now noticing. Of course, instead of moving on with that, I could just go play some more mini games at the Gold Saucer.